Symbiosis is defined as a cooperative relationship between two dissimilar organisms for the mutual benefit of both. This sounds a bit sterile, but the stories this word describes are fascinating and irresistible. This stone sculpture, “A Tree Needs A Bird”, is about the very cool relationship between the Clark’s nutcracker and the whitebark pine, two high-altitude species in western mountain ranges. Whitebark pine trees grow at the tree line in small stands in the Canadian Rockies and farther west in the Cascades and Sierras. They can live to be hundreds of years old. Whitebark pine seeds contain an abundance of fat. This makes the seeds a very desirable food for animals that live high in the mountains because the fat keeps them warm. Most pine cones open when the seeds are ripe to allow seeds to disperse and new trees to grow. The whitebark pine cone does not open as it ripens and must be opened by some outside means. The Clark’s nutcracker is named for William Clark, who “discovered” this bird on his trek through North America with Meriwether Lewis in the early 1800’s. It is a member of the Corvid family, which includes crows and jays. Corvids are some of the smartest birds on the planet and known for their superior memories. One of the Clark’s nutcracker’s favorite foods is whitebark pine seed. As you might guess, Clark’s nutcrackers pry open whitebark pine cones with their long beaks and dig out the seeds. In fact, nutcrackers are so incredibly fond of whitebark pine seeds that they want to eat them all the time. The nutcrackers have a pouch under their tongues that can hold several dozen pine seeds. They pry open the cones, harvest the seeds, carry them in their tongue pouches, and bury them in the rocky soil so they can eat from these caches all year long. They cache several thousand seeds in a season. Nutcrackers have a superb corvid memory and know where the seeds are stashed. They do not eat some of the thousands of seeds that they bury. Some of those uneaten seeds grow into whitebark pine trees. Clearly, this tree needs this bird. Whitebark pine forests have been decimated by the pine bark beetle infestation. This tree is now endangered due to crippled populations and global warming. Winters are no longer cold enough even in the high peaks to kill pine bark beetles. Beetle numbers and destruction of pine forests have increased exponentially. Moreover, natural burning used to control another killer called white pine rust fungus, but humans have interrupted that natural process by preventing fires. The web of life is unraveling for the whitebark pine. The Whitebark Pine Ecosystem Foundation is a group of volunteers in the US and Canada who grow and plant fungus-resistant whitebark pine seedlings. This tree needs people, too . . . and we all need trees. The stone is Belgium Black Marble, one of the hardest marbles on the planet. It is very brittle due to the high carbon content and therefore very chippy. This stone will dull steel and diamond tools in days or weeks. It usually takes months to destroy tools used on other marbles. Cutting is very slow, even with diamond blades and burrs. Sulphur combines with carbon in the creation of Belgium Black and the stone stinks like swamp gas when the surface is disturbed—i.e. during cutting and sanding. The stone is like a force unto itself and monopolizes all one’s physical and mental faculties while one is carving it. That said, Belgium Black is absolutely gorgeous. I have always maintained that supreme beauty only comes with supreme sacrifice. This is definitely the case with this most hard and outrageous of marbles. The color and consistency of the stone is dark and deep, thick and rich—the penultimate black. Finishing is a long process culminating in a jubilant pay-off. Nothing shines like Belgium Black! The Sivec marble inlay was a mind-bender. 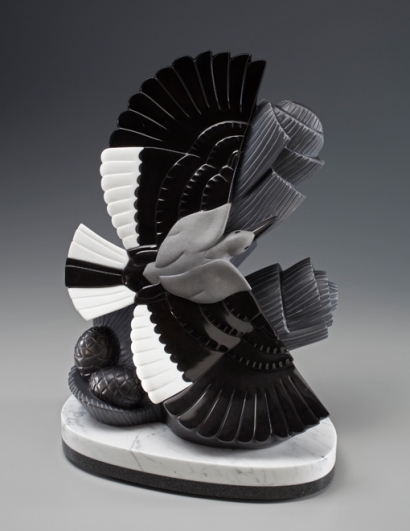 The scalloped juncture of white and black marbles on the secondary feathers was the supreme challenge in this sculpture and the most alluring design element. I adore dramatic combinations of black and white, this time with grey, and this delightful mania fueled my quest. “A Tree Needs A Bird” took seven months of consistent work to complete, the longest I have ever spent on one sculpture. It is a weird sensation to be struck suddenly by the graphic elegance of the Clark’s nutcracker (hey, I can do this with a white marble inlay!) Later enthralled by the story of the bird and the whitebark pine (so cool you couldn’t think up a better story!) And then spend over half a year making this sudden impact real. This is much like animation where I spent weeks and months at a time on 10 or 15 seconds of very cool action. Thank goodness I created a slide show of images from the stages in the making of “A Tree Needs A Bird.” The slide show above goes by in about 16 seconds–another weird sensation that brings the process full circle. The idea hits like lightning. The process of creation seems never-ending. Then here are these rapid-fire images to remind me and show you what happened along the way. The creative process blows my mind it is so cool! As always, your work and words astound, amaze and inspire. Absolutely fantastic and stunning – a story made visual. Bravo! Thank you, Friend! I think it is the stories that make for compelling sculptures/paintings/films, whatever form of expression. It is the stories that inspire the content. Bravo Ellen! Such an incredible sculpture and story!! Thanks, Brian. Bravo to you for your new gallery in Breckenridge! Thanks, Angelo! The story struck a responsive chord. Oh my goodness Ellen, that is just stunning! Thanks, Julie. 7 months and this is what I have to show for it. So glad you like it!